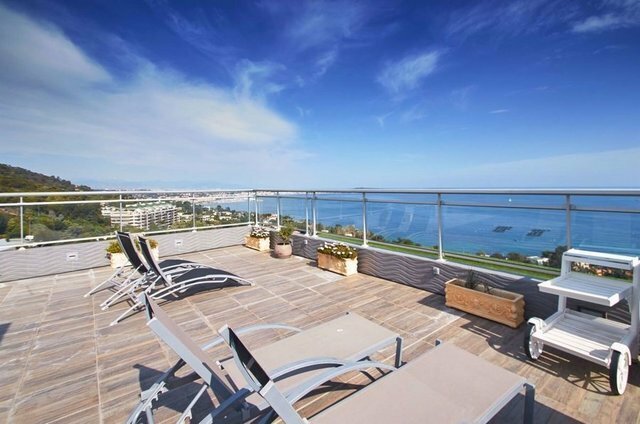 This luxurious duplex penthouse is located in the highly sought after residential area of Cannes Californie, close to the Croisette and its palaces, as well as the waterfront. In a prestigious residence built in the 1970s, nestled on a landscaped park of about 8 hectares with swimming pool, tennis court, playground for children and a golf course. This 170 sq.m penthouse offers mainly 3 en suite bedrooms, a kitchen, living and dining room with fireplace and an office. With 150 sq.m of terraces and exceptional sea views, this apartment offers very high quality services and a jacuzzi, a cellar and a garage.